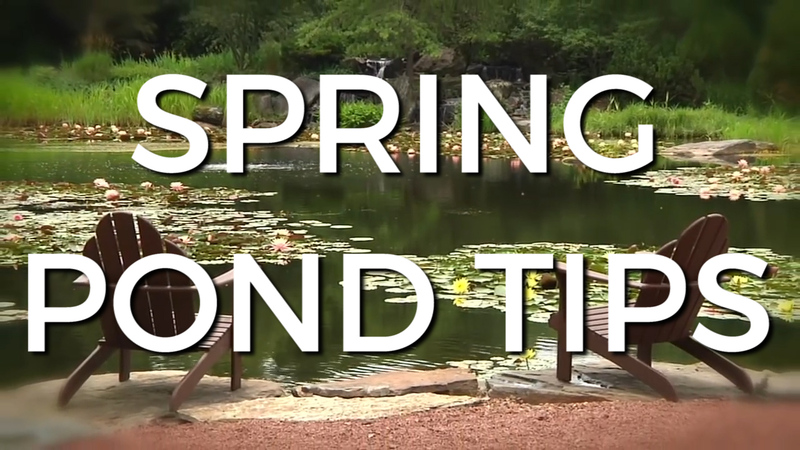 TOP 3 SPRING START UP TIPS for your POND With spring right around the corner, it is time to get a little maintenance done on your pond. Whether a full drain and clean-out or just a partial, the main objective is to remove the bulk of the bottom debris- sludge, leaves, etc. During the warmer months, natural bacteria would typically break down this debris, but in the cooler months those bacteria go dormant. Thus, an excess of organics and believe me the algae will enjoy those. We have all the necessary tools here, whether you need gloves, a net or even a vacuum. 2. Start adding beneficial bacteria. When the water temps start to stay around 50 degrees fahrenheit, it's time to start adding your beneficial bacteria. This will slowly build up the nitrifiers. It also improves dissolved oxygen levels while metabolizing dead algae and dissolves away organic sludge. 3. Check pump and filter. Your pump is your pond's lifeblood, providing necessary circulation and aeration for fish. Stay proactive with maintenance and make sure it's clean and ready to run come spring. These simple steps should help you ensure a more stress-free life come spring. For additional questions on what we discussed today, please don't hesitate to call. With spring right around the corner, it is time to get a little maintenance done on your pond. Knowing your water temperature is extremely important when it comes to feeding. Feeding the wrong type of food in certain temperatures can create severe issues for fish and the pond as well. There's only one thing worse than green water - and that's tea colored or brown water. Often times, the end fall, beginning of winter brings with it discolored water. The use of barley dates back to the treatment of acre farm ponds hundreds of years ago. Today, it's still widely used, and quite popular. Used as a natural water treatment and conditioning aid, the treatment process is actually quite interesting. All tips on in this article should be scrutinized for their application to your individual needs. Everything you need to start your pond up for the spring. In order to succeed at keeping fish, ensure that you are providing the best water conditions possible. Too often, disease and death among fish is a result of bad water quality. The following are water quality parameters that you must adhere to in order to be successful.